Loyalty Gator gives you more perks with unlimited transactions and more! With Loyalty Gator, you're not restricted on how you can reward your customers. Our flexible program styles will allow you to award points for dollars spent, actions, or referrals. Not looking to offer points? No problem - utilize our digital punch card program (buy X, get one free) or choose from our other reward program options. Try Loyalty Gator free for 30 days to see if we're the perfect fit for your business! All you need is internet access! There's no software to download and the platform is extremely user-friendly. You get a Gator rep assigned to your business for any questions along the way! Customers can start signing up for your program in-store or via your website! You're never locked into a long term relationship. We don't like contracts just as much as we don't like transaction fees. That's why you will only ever be billed month-to-month, and you are free to cancel whenever you want... but we're pretty confident you'll like us! It's backed up daily, and never shared. Every precaution is taken to ensure your data is safe with uninterrupted access to the servers. The servers are housed in a top tier secure data centre with 24hr surveillance and restricted access, meeting the industry’s highest standards. Never worry about viruses or manual updates again. Our low monthly pricing is extremely competitive. Our goal is to provide you with an affordable customer loyalty tool customized to suit your requirements - you pay for what you need, not what you don't. We never charge transaction fees and there are no hidden fees! What's the point of having a loyalty program if you can't track the metrics? 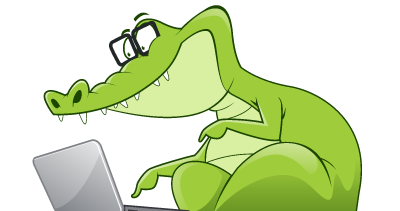 Loyalty Gator gives you a versatile reporting tool built into the program. Want to export your customer data to Excel® for your own marketing campaigns? It couldn't be easier. You decide employee access and privileges. Your real-time reporting tool lets you review employee transactions so you can see what everyone’s doing! The reports are also a great way to identify employees who are processing the most transactions. It's easy for your customers to sign up for your loyalty program online via their computer, tablet, or smartphone, plus perform a quick balance lookup. Get more traffic to your website! All programs allow your customers to enroll online and check their balance directly on your website. If a customer leaves after a poor experience will you know about it? Easily monitor customer satisfaction in real-time and get instant email notifications so you can respond right away... turning poor reviews into satisfied ones before they end up online. You don't have to worry about how many loyalty transactions you're processing...ever! We never charge transaction fees because we want you to grow your loyal customer base - not be punished for it! Whether you have 5 customers or 500,000, you will never pay a transaction fee. You own all of the data on your program. Some loyalty companies don't mention that they retain ownership of your data. This makes it difficult to leave your loyalty provider if you choose to go somewhere else in the future. We believe your data should be yours. Retail, educational, non-profit, corporate, franchise, you name it - our loyalty platform can meet your requirements. Reward your customers your way for desired actions or purchases! Have a specific idea in mind but not sure how to execute it? Ask our knowledgeable reps how we can develop a program specific to your needs. Seamlessly add Loyalty Gator to your business. Whether you have a retail store, or you're on the go, it's easy to get connected. Because the loyalty program software is web-based, you can connect from almost anywhere! Click here to see which option is right for you. It's so important to create customer awareness about your new rewards! Promote your loyalty program in-store using our free counter top marketing templates. Ask us how to order plastic loyalty cards, custom designed with your own branding to make them 100% yours. Loyalty Gator makes it easy to segment customers and send meaningful communications. Find out who your best customers are, or who hasn't been back in a while and send them an email. Click here for more information about target marketing. Loyalty Gator makes it easy to import customers or customer transactions into your loyalty program. Whether you are migrating to Loyalty Gator from another provider and want to preserve your data, or you want to upload bulk transactions at once, we’ve got you covered. Not only do satisfied employees perform better, but employee loyalty relates to customer retention. It's easy to track staff achievements to recognize top performers. Click for more information about employee rewards and recognition programs. 70% of persons from higher-income households ($125,000+) are more loyal to companies that offer rewards programs. 82% of small to mid-sized businesses indicated that offering gift certificates or gift cards has had a positive impact on their bottom line. Customer spending is 46% higher with companies that offer reward card programs. Increase spending among your loyal customers.